But as a writer — not to mention a birder — I suspect the creator is the often the worst person to ask about his creation. I think there’s a much better candidate than either of the two already put forth. There is a real life bird who may not look as much like Woody as the Pileated does, but is a better match than the Acorn — and in personality is much more like the crazy cartoon than either. That bird is the Northern Flicker. If you’ve ever heard the Flicker’s call (which can sound a lot like a Pileated) you know what I mean. A lunatic laugh followed by a rapid drumming. 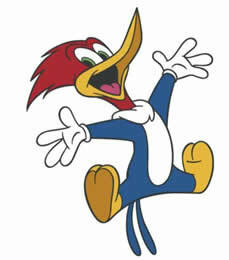 This past spring the early morning in our neighborhood were filled with Woody Woodpecker imitations. 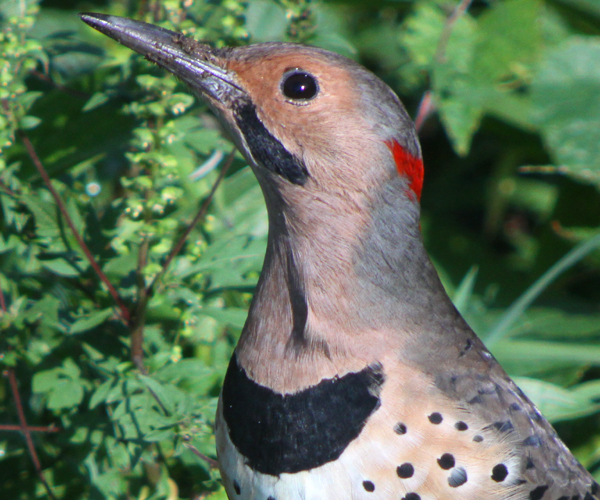 The Northern Flicker is a moderately large woodpecker — bigger than a Hairy or a Downy, but not nearly as large as a Pileated. Unlike other woodpeckers, you often see them foraging on the ground. Ants are one of their main sources of food. In my neighborhood they are also very fond of suet feeders — and in the winter I’ve even caught them raiding my tube feeders. They are pretty much year round residents throughout the continental United States. Like most Woodpeckers, they use their drumming not only for foraging, but for communication. In this area, they can often be heard in the spring banging on stovepipes, rooftops, and telephone poles. Whatever will make the most noise. This year one Flicker decided to use the wall of my office, showing up early every morning and pounding away for hours at a time. I could go outside and shoot him off, but he quickly returned. Even with a bird lover, that’s a good way to wear out your welcome. My first close up encounter with a Flicker was at the wildlife center. I hadn’t been working there very long, and I was assigned to the ward, where the newly arrived patients, or those not ready to be moved to outside caging, were kept. Most days the patients in the ward were mostly birds. I only knew very generally what a Flicker was when I saw the name on the cage card. My job was to take them out, weigh them, move them to a clean cage and then clean up after them (always fun with birds). Most birds, when you open the cage door shrink back toward the back, trying to avoid you. Sometimes they cling to the door of the cage, so that when you open it, the flicker can take off and escape. There’s nothing like chasing a flicker around the ward with a net, trying to catch him without hurting him. But the all-time favorite flicker strategy is to scream like a slasher movie victim and fly straight at the person’s head. I dare you not to duck when that happens! The result is the same though — loose Flicker and plenty of fun hunting him down. A couple of years ago, in the spring, the Wildlife Center had a flicker in one of the outdoor pens, getting back into shape before being released. The pens have wire mesh tops so they are open to the elements. A local flicker male decided he didn’t like having another male in his territory, even if the interloper was contained. So he took up position in a tree above the pen and proceeded to berate the captive all day long. Flickers are very territorial. Woody Woodpecker’s theme song was “Everyone thinks I’m crazy.” Now I ask you, what bird could sing that song more honestly than the Flicker? I recently saw a flicker take off straight into a nearby chain-link fence (hard enough for me to hear the clang as it hit). Then it turned and flew off in the other direction. So I would say describing flickers as “spastic” is justifiable. 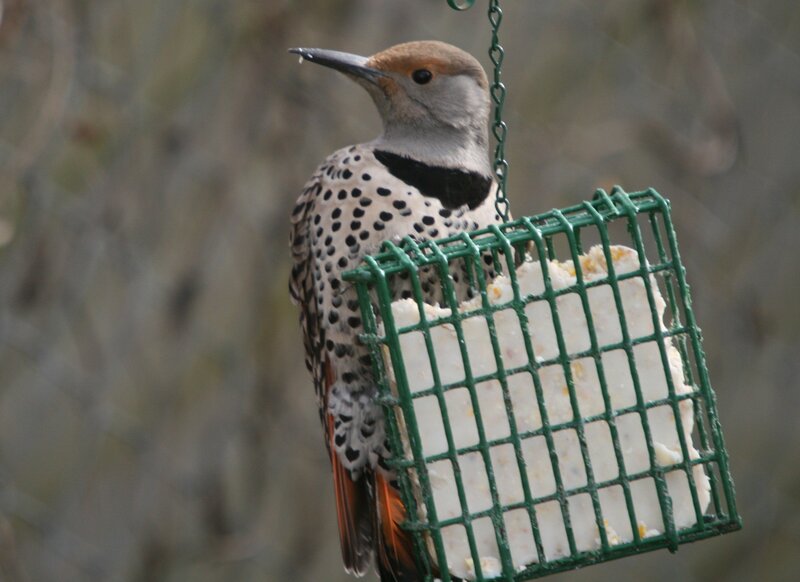 Cool shots of the flickers, they are cool birds. They seem shy around here. A few years ago, shortly after moving to Gabriola Island (in the Pacific Northwest) I was awakened at dawn by a noise that made me think our furnace was about to explode. Then I remembered our new house didn’t have a furnace. But something was sending vibrations through the whole house. I went outside, looked up. There he was: a flicker drumming on a metal downpipe on the roof right over the bedroom. When I flailed my arms and shouted, he (eventually) flew off, only to land on our next door neighbour’s cabin where he resumed the same drumming act on the neighbour’s metal downpipe. It sounded pretty cool from a distance, actually. Just not something I wanted right above my head at dawn. Where Are You Birding This Third Weekend of April 2013?